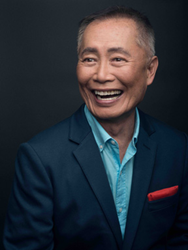 Elliott Masie, Chair of The Learning CONSORTIUM, is honored to feature his friend, colleague, social change advocate, and storytelling icon George Takei at his Learning 2016 Conference from Oct 23 to 26, 2016 in Orlando, Florida. George Takei will be featured at Elliott Masie’s Learning 2016, taking place October 23-26 in Orlando, FL. Elliott will interview George on a wide range of topics at Learning 2016, including Storytelling in the Digital Age, Social Media Messaging, The Role of the "MEME" as a Tool for Impact and Change, and The Vibrancy of Content and Context in Stories. In addition, George is honored to help interview Astronaut Scott Kelly "From the Starship Enterprise to the International Space Station” in this season of the 50th Anniversary of Star Trek. George Takei is best known for his portrayal of Mr. Sulu in the acclaimed television and film series Star Trek. He's an actor, social justice activist, social media mega-power, star of the Broadway musical Allegiance, and subject of To Be Takei, a documentary on his life and career. Now a community activist, Takei serves as chair of the council of governors of East West Players, the nation's foremost Asian Pacific American theater. He is also a member of the Human Rights Campaign, the largest national lesbian, gay, bisexual, and transgender political organization. Takei is Chairman Emeritus of the Japanese American National Museum's Board of Trustees; a member of the US-Japan Bridging Foundation's Board of Directors; and served on the Board of the Japan-United States Friendship Commission under President Clinton. His first book, his autobiography, To the Stars, was published in 1994, and in 2012 and 2013 he published his second and third books, Oh Myyy! There Goes The Internet, and its sequel, Lions And Tigers And Bears: The Internet Strikes Back - both about his forays on social media and the internet, making the Amazon e-book and paperback best-seller lists in 2012 and 2013. George will join featured keynote speakers NASA astronaut Captain Scott Kelly and Emmy-nominated filmmaker, speaker, and Webby Awards Founder Tiffany Shlain at Learning 2016. The conference will focus on how learning is changing and the roles that technology, social networks, and storytelling play in building new workforce skills. For 26 years, Elliott Masie’s events have been the premier conferences for leaders in the learning and development industry. Learning 2016, which will be held at Disney’s Coronado Springs Resort and Convention Center October 23-26, will bring together 2,000 US and Global learning leaders from over 800 companies to attend 6 keynotes, over 150 breakout sessions, MeetUps, and many more experiential elements, including an active gamification component.